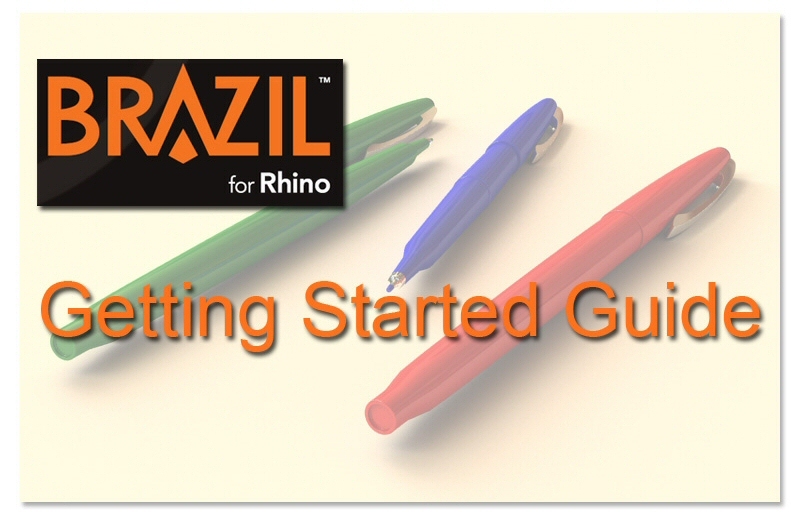 This "Getting Started Guide" is intended for the Rhino user unfamiliar with advanced rendering programs such as Brazil. If you are fluent when it comes to industry standard rendering technologies, you will certainly breeze through the explanations included. If you are new to Brazil and advanced rendering, much of the learning process will come down to absorbing new terminology such as "Global Illumination" and "Render Cache". Once you have a basic understanding of these terms you'll find it easy to set up a rendering in Brazil for Rhino. In this guide you'll find a synopsis of the basic settings that can be used for high quality renderings. Once you become accustom to the principles of rendering in Brazil for Rhino you?ll be free to explore the veritably endless possibilities! Before we look at the settings dialog for Brazil, you?ll first need to download and open the example file Brazil_Pens.3dm . Also make sure to set Brazil as the current renderer in the render drop down menu of Rhino before opening the Brazil Pens file. Once open, click the blue render icon or type the command ?Render? in the Rhino command line. All objects in the scene are their default white color at this time and rendering the perspective view should produce the following default result. Now open the settings dialog for Brazil by typing the command "BrazilOptions" in the Rhino command line or by selecting "Renderer Settings" from the Brazil drop down menu. In the settings dialog open the "Simple Luma Server" panel and check the box to turn on the "Sky light". The Brazil sky light has been turned on and is casting white light evenly throughout the scene. To make the rendering brighter or darker we can change the intensity of the sky light by adjusting the "Brightness" value also located in the "Simple Luma Server" panel. Rendering the scene again with the sky light turned on will produce the first image below. To create the second image below you'll need to increase the resolution. There are two sections in the Brazil settings dialog to look at when determining the resolution of your rendering. The first section is the "Simple Antialiasing" panel. The settings here determine how sharp the edges of your model will look in the rendering. The detail of fine textures also depend on these settings. The simple options consist of three choices... "Low, Medium and High". These correspond to the numbers in the "Min" and "Max" fields which can be seen in the detailed antialiasing controls. Higher values equal sharper edges. The second section in the Brazil settings dialog that controls resolution is the Simple Luma Server which we've already used. In the bottom portion of this section there are two choices for "Quality". Setting the quality to "slower and smoother" will produce smoother shadow detail but will take longer to render. These two simple quality settings are changing what is called the "sample rate" for the sky light. If you click on "show detailed controls" in the Simple Luma Server you can see the changes to the sample rate being used. Higher sample rates equal smoother results. So far, the sky light illuminating the scene has used what is called "direct illumination" only. 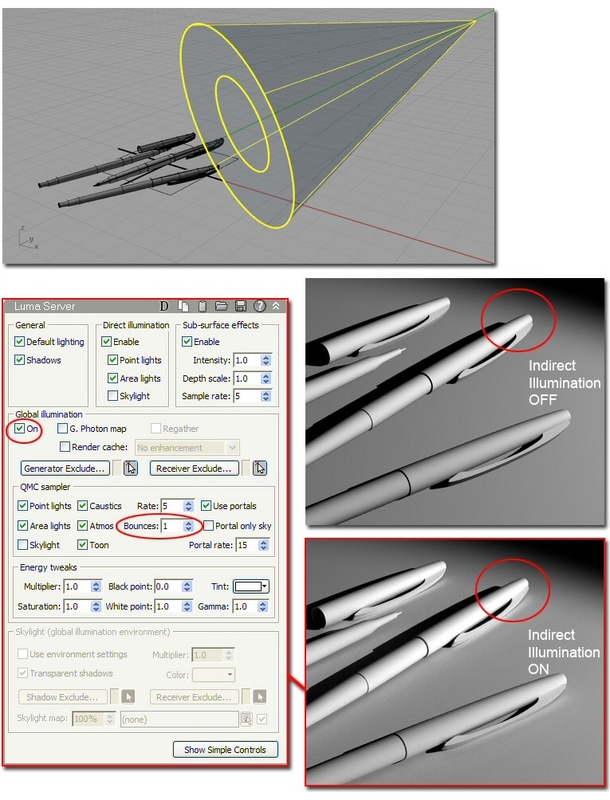 This method will light the model by shining light directly at it. In the case of the sky light this is happening evenly around the model from all directions. 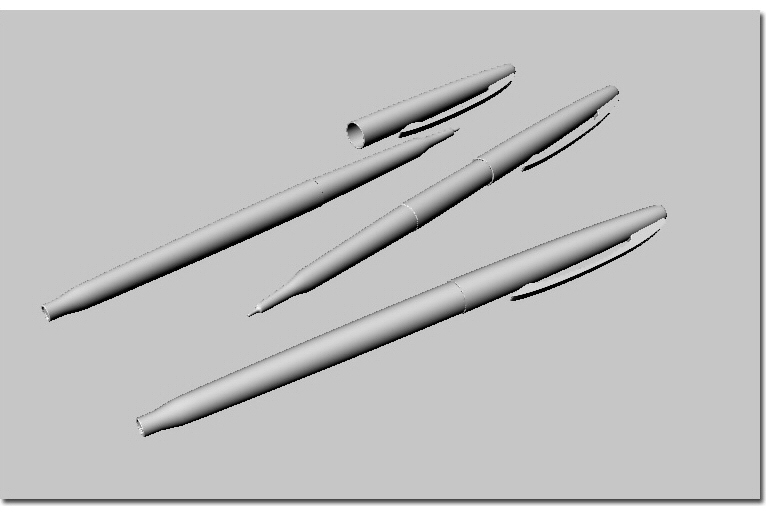 The result is a nice soft shadow where objects such as the pens and the ground plane meet. Brazil also has the option for using another lighting method called "Indirect" or "Global Illumination". This method allows light to bounce off of objects in the scene and further light the model. Both direct and indirect illumination are often used to light a model more realistically but Brazil does allow the use of just one or the other if desired. Since the sky light shines light evenly around the model it is easier to see the effect of indirect illumination when a single directional light source such as a spot light is used. The example below illustrates the use of a single spot light with the sky light turned off. The detailed control panel for the Luma Server contains a field for the number of times the light will bounce in the scene. When indirect illumination is calculated for the sky light the number of bounces must be set to a minimum of two for any effect to be seen. Open the material editor for Brazil by choosing "Material Editor" from the "Render" drop down menu in Rhino or by typing the command "MaterialEditor" in the Rhino command line. - drag and drop a material swatch onto the object in the scene. 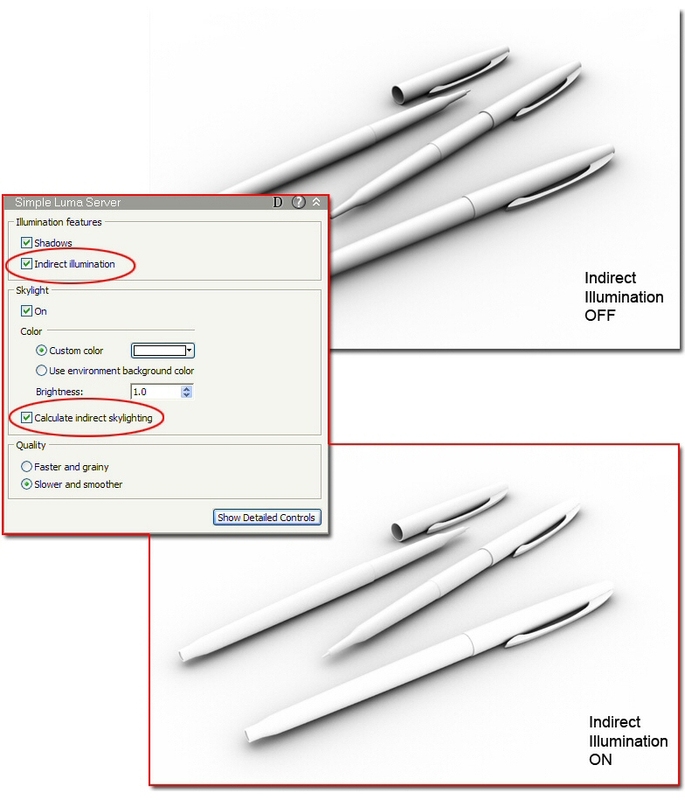 - right click over a material swatch and assign it to a selection or layer. - use the icon in the material editor dialog to assign the current material to a selection. - click on the icon to make a new material in the editor and choose the type of material you'd like to create. - right click over a material swatch in the editor and choose to "Create New". There are several material types included in Brazil that can be used to make just about any type of material. For instance, the Brazil Chrome and Glass materials can be used as a base for any metallic or translucent material. Likewise, the Brazil Advanced Material also called BAM is extremely versatile having several material types included as base shader options. The first material parameters to get familiar with are color and reflectivity. The basic material which is in the material editor by default is very simple and has only a few controls available for customizing it. The Brazil Advanced Material (BAM) on the other hand has a large number of parameters that can be changed and it is often a good choice even for simple materials because it is so expandable. The color of a BAM is controlled by clicking on the "Diffuse" swatch in the Brazil default panel as shown below. The reflectivity value for a BAM is controlled by the "Reflectivity" swatch also located in the Brazil default section. Both of these swatches will open a color picker for selection. The reflectivity value can be set strictly in the gray scale range if no additional color is desired in the material. As we discuss the basics of the material editor, it may be helpful to think of materials in Brazil as simply containers for textures. A texture can be a .bmp or .jpeg image you?ve made or even a procedural pattern already installed with Brazil such as the "Noise" or "Tile" textures. Let's take a further look at the BAM material. With the BAM selected, scroll down to the "Basic Surface Parameters" panel in the material editor. You?ll see several slots with the word "none" inserted. 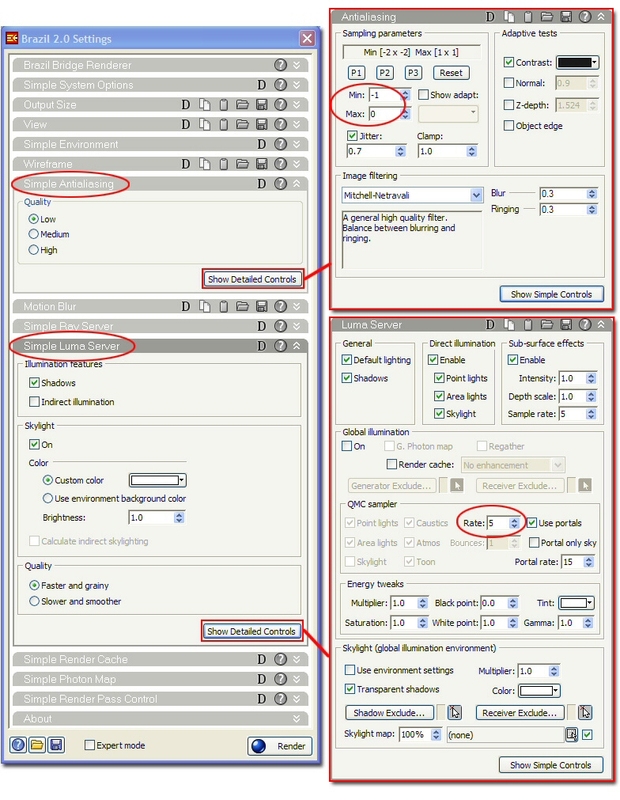 These "channels" are aspects of the BAM material chosen and can receive textures to customize the material further. 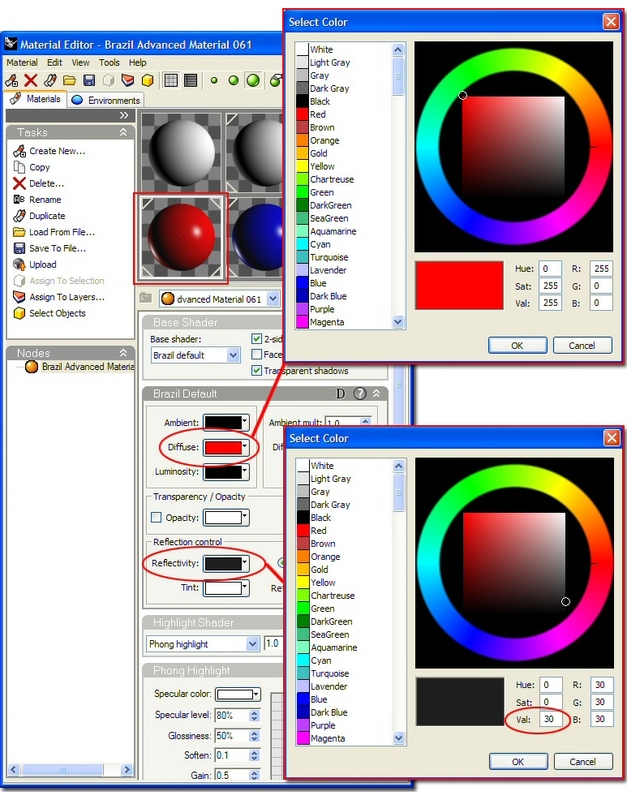 For example, right clicking over the empty slot to the right of the "Color" swatch will allow you to select an existing texture or create a new one by using the "Change" option. Here are a few simple uses of Brazil materials and the settings used to produce them. Note that the material editor has an expandable panel to the left of the material thumbnails that lists the "nodes" in the active material. When a material is selected this panel shows all the textures applied to that material. Selection of an individual node will display it's parameters in the material editor. 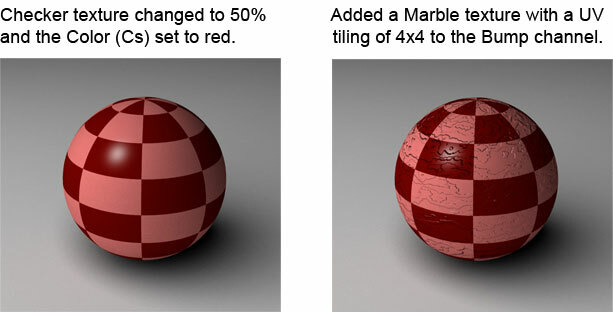 In the case of the checkered sphere example, the checkered textured was selected from this list and edited. For instance, the number of times a texture is tiled on an object is controlled in the "Local Mapping" section for the selected texture. In order for the textures in your materials to look correct when applied to your model you?ll need to understand the concept of texture mapping. Take a look at the two spheres below. One sphere has a checkered texture "mapped" around it?s own UV coordinates. While the other has been mapped with the identical texture projected on to it as if from a flat plane. This is due to a different texture mapping method chosen for each sphere. 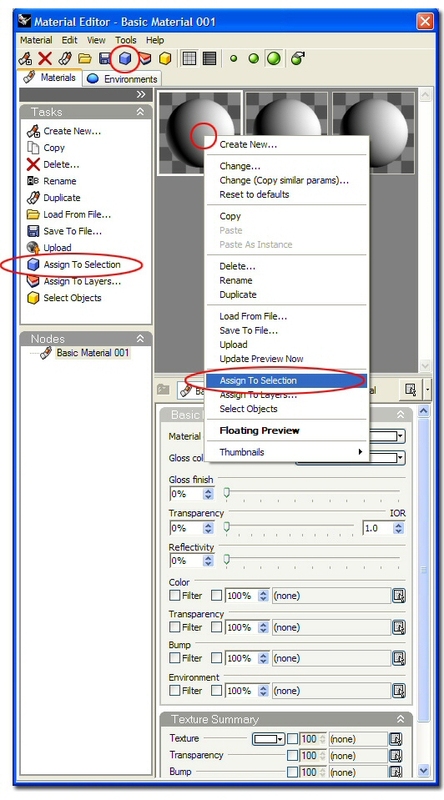 With any surface or polysurface selected in Rhino, click on the "Object Properties" icon or type the command "Properties" in the Rhino command line. From the drop down list at the top of the Object Properties dialog select "Texture Mapping". The default texture mapping projection for all objects is "surface" which means that textures assigned to materials and applied to that object will flow along the UV direction of each surface within the object. Check the box titled "Show advanced UI" in the Texture Mapping section of the Object Properties dialog. An "Add" button will appear allowing you to create alternate methods of texture mapping materials to your selected object(s). After adding a new texture mapping channel to your object, expand the drop down list in the "Projection" row of the "General" section. Here you will see six different styles for texture mapping materials to your selection. Depending on the shape of your object and also the pattern of your texture, you?ll want to assign a specific projection mapping method for the desired result. In general, it is best to use a projection method that closely resembles the overall shape of your selection. There is also a "Show Mapping" and "Hide Mapping" button that can be used to display or hide the texture mapping widget for the active selection. You can reposition this widget if you like and alter the look of the resulting projection. 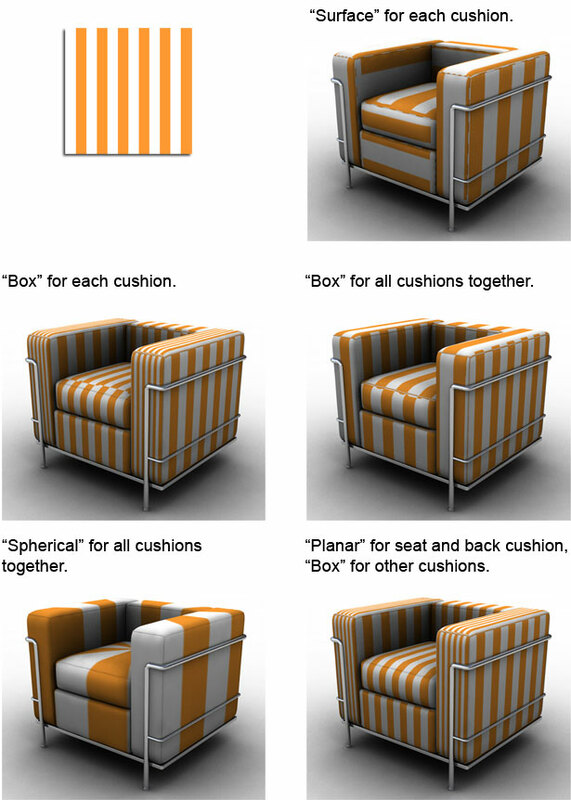 In the following example, the square cushions of the sofa chair work well with the "Box" style of texture mapping since they are box shaped. However, two of the cushions responded better to the "Planar" projection type and were individually selected to change their texture mapping method to be planar. 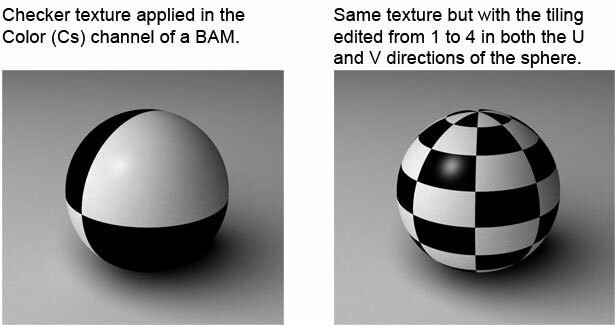 Using the same texture, several different projection methods are shown below. A big part of how a rendering looks has to do with where the objects rendered are supposed to be. Changing the environment surrounding your model in Brazil is great way to produce more realistic lighting and reflections. Select the "Environments" tab in the Material Editor dialog if it?s still open or type the command "EnvironmentEditor" in the Rhino command line. The default or "Basic Environment" is a solid gray color. This solid color is all that will be reflected in the model and the resulting reflections can look a bit flat. Just as with the material editor, right clicking over a sample swatch provides additional options for working with environments. Selecting "Create New" will launch the Content Browser dialog with a list of the environment types to choose from. Create a new "Brazil GI Environment" in the Environment Editor. You?ll then see it represented in the Environment Editor as another sample swatch... it will look black at first. We just need to insert a "High Dynamic Range" image to be used as the environment. There are many HDR images available online for free or for purchase. Download this one of a beach provided by Paul Debevec to give the technique of image based lighting a try. Save the .hdr image somewhere memorable on your computer and then add it to the empty "Equirectangular Texture" channel in the Brazil GI environment you just created. You should see the sample swatch update in the Environment Editor. Double clicking the GI environment thumbnail will make it the active environment and the corners of the thumbnail will highlight. In the Brazil settings dialog go back to the Simple Luma Server panel we began with. In the "Sky Light" section, enable the option labeled "Use Environment Background Color". This option will take the HDR image from our active environment and use it as the sky light in our scene. 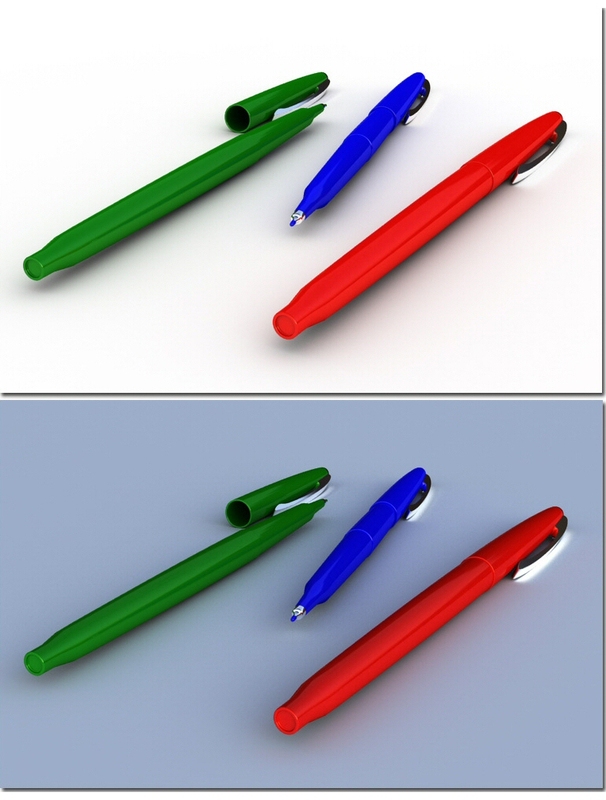 Try a render with both options to see the difference. Notice that even when we are not using the HDR as our sky light color the HDR image will still be used for the reflections in our pens making them look glossier. 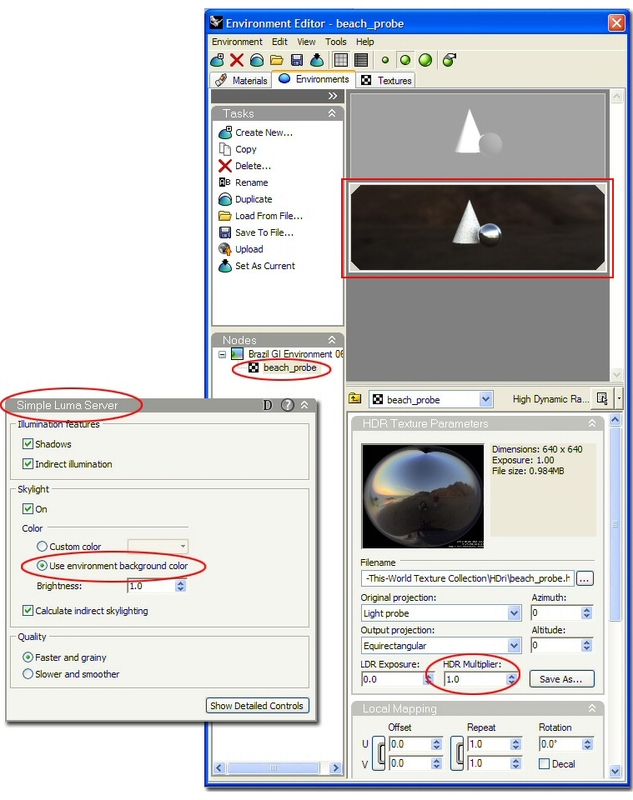 To make the HDR brighter you can increase the multiplier value for it in the environment editor. You now have the basic building blocks to effectively use Brazil to render your Rhino models. You should also note that any option settings, materials, textures or environments can be saved and loaded into Brazil when needed. 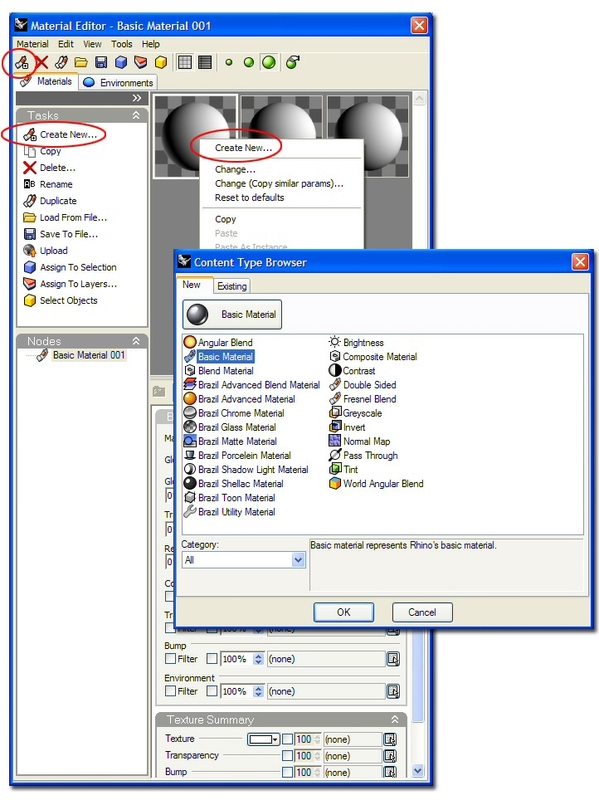 You can find the "save to file" and "load from file" options when right clicking over a material or environment swatch in the corresponding tab of the editor. Options can be saved and loaded through the two buttons at the bottom of the Brazil settings dialog.